RVHS junior Kaylee Gillman (30) drives along the baseline during the Lady Raiders 72-10 setback to Alexander on Monday night in Bidwell, Ohio. 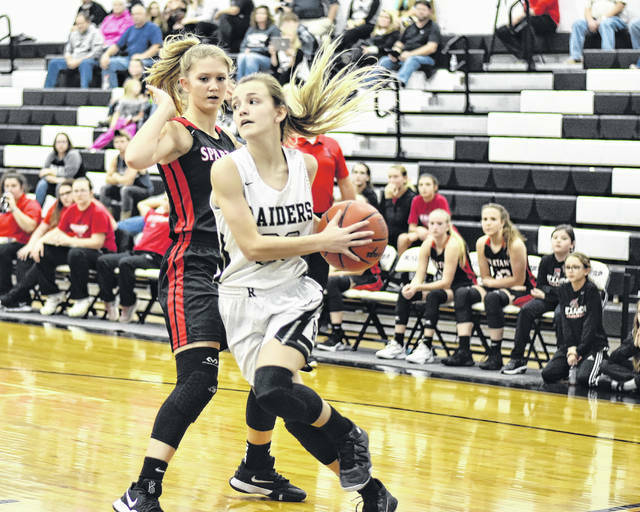 BIDWELL, Ohio — Too many turnovers and an early deficit proved to be too much for the Lady Raiders to overcome. 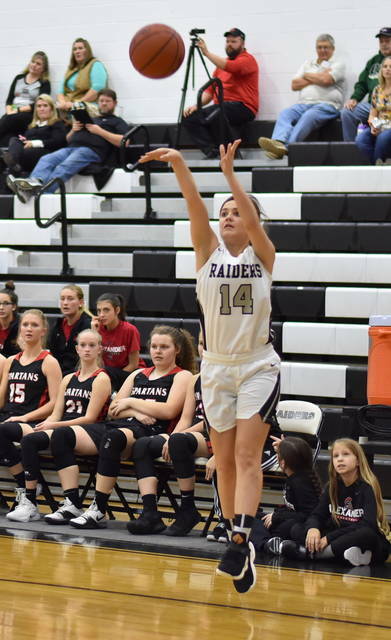 The River Valley girls basketball team was held to just three points of Monday night’s Tri-Valley Conference Ohio Division contest against visiting Alexander, as the Lady Raiders suffered a 72-10 setback. RVHS (3-2, 0-1 TVC Ohio) were held without a field goal in the first quarter, as the Lady Spartans (3-0, 1-0) utilized a 21-0 scoring run to take control of the contest. River Valley freshman Lauren Twyman provided the lone tally for the hosts in the first half, as she sank a trifecta to narrow the margin to 26-3 with 6:11 remaining until the intermission. The Lady Spartans, however, closed the second quarter on a 17-0 run to carry a 43-3 advantage midway through the game. Alexander outscored the hosts 12-4 in the third quarter to increase its lead to 55-7 entering the finale. The Silver and Black scored their final points of the contest, when senior Beth Gillman hit a shot from long distance with 2:13 left in the contest to close the gap to 66-10. AHS, however, closed the game on a 6-0 run to earn a 62-point win. River Valley finished with a 4-of-26 (15.3 percent) shooting performance from the field, including 2-of-12 (16.6 percent) from three-point range. In contrast, the Lady Spartans shot 33-of-61 (54 percent) overall, including 10-of-21 (47.6 percent) from long distance. From the free throw line, Alexander was 3-of-4 (75 percent), while the hosts were 0-of-4. The Lady Raiders won the rebounding battle by a slight 28-23 margin. The Silver and Black also committed 34 turnovers in the setback, while AHS had 14 giveaways. Twyman finished with five points to lead RVHS in scoring, including on from long distance. Gillman was next with three markers, while Hannah Jacks concluded the Lady Raiders scoring total with two points. Rachel Richardson paced the Lady Spartans with 15 points, as McKena Rice followed with 14 markers. Sydnie Bolwin was next with 12 points, while Taylor Meadows and Kara Meeks were next with 10 points and eight markers apiece, respectively. Jadyn Mace provided five markers, as Mallory Rankin followed with four points. Erin Scurlock and Jaide Allison each finished with two points apiece, respectively, to close out the scoring totals for Alexander. The Lady Raiders will look to avenge the setback, when the travel to face Alexander on Jan. 14 in Albany. Up next for River Valley, a road date with TVC Ohio foe Wellston on Thursday.